Objective: Help community leaders rebuild homes for families who lost theirs in recent natural disasters, including Hurricane Matthew. Interested in funding the rebuilding of a home/s, contact us here. La Gonâve has faced significant and widespread destruction over the years from numerous natural disasters, and yet the island has received very little attention from the national government or relief from the international community. 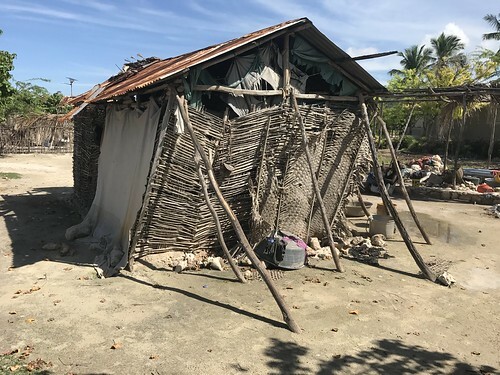 Official assessments from La Gonave after Hurricane Matthew found that 5,867 homes had been severely damaged and 805 homes completely destroyed. Through a community-led housing project, Roots of Development proposes building 150 safe, durable, and cost-effective homes in a way that sustainably strengthens local capacity. Since 2008 Roots and its local community-partners have been implementing successful community-driven housing projects on La Gonâve. All of the homes built have remained fully intact, despite hurricane Matthew’s category four 145 mph winds and the catastrophic earthquake of 2010. Individual and corporate support financed the building of these homes. It has only been a lack of attention and funding that has prevented more homes from being built on La Gonâve. Homes are built on plots of land legally owned and inhabited by the beneficiary families, which avoids relocating families and disrupting communities. In choosing which families will benefit from a new home, the local community leaders use a set of criteria that takes into account the level of vulnerability of a family. Single families, families with young mothers, aging or disabled relatives, and others vulnerable groups make-up a significant portion of the families that are chosen to receive a new home. In 2008 and 2010, NGOs carried out housing projects on La Gonâve that involved temporary or transitional housing – most of which are showing significant signs of deterioration today. These NGOs had little to no familiarity with the island, and they did not seek input from local leaders during the design and implementation of their projects. Materials and labor used were mostly foreign to the island, and the lack of community involvement created conflict and resentment within community members. After a decade of working with the local population on La Gonâve, Roots has the knowledge and experience required to work effectively and efficiently on the island. Roots’ work and impact is sustainable because its development approach focuses on local ownership, participation and leadership; and building local capacity. Roots proposes building 150 safe and durable 36m2 (9m long x 4m wide) reinforced concrete two-room homes over a twelve-month period. The areas in which the homes will be built will be chosen in partnership with La Gonâve’s municipalities and other local leaders. To oversee the community-driven components of the project, Roots will work with its local partner of many years, CDECH. CDECH is a Haitian organization with an established local capacity-building program and strong ties to La Gonâve. CDECH will guide the local population through the community-driven development process by delivering workshops on community leadership and development, and overseeing all elements of community engagement. The cost of each home is US$6,168, although it is expected this number will be lower as the contributions of the general community and each beneficiary are factored in (e.g., collection and transportation of water, rocks, sand, concrete, etc).